If you want to put a little sparkle in your life, take time to stop by the Classic Creations of Nan which is beautifully located at the Branson Craft Mall at 2900 Green Mountain Drive in Branson, Missouri. Categorized under clothing stores, Classic Creations of Nan has been making Branson’s original “Bling” since 2005. If you like the glitzy shirt sets and jackets, this is the place to go. In this great shopping spot, you can buy pre-made sets off the rack, or you can have your order customized such as shirts and jackets while you wait and watch it done. Classic Creations by Nan has been in the business for 10 years of embellishing clothing with rhinestones for their customers in Branson. Matching shirt/blouse and t-shirt sets are about $40, and they guarantee their work. This unique shopping spot carries a full line of ladies knit shirts, both ¾ sleeve and short sleeve; scoop neck and “V” necklines. A special motif can be added to any of the knit shirts you choose. You can find samples of their work at their website: classiccreationsbynan.com. The store is a great shopping place for those who are looking for customized attire and accessories for their special event. Classic Creations can make something special for you, while you shop. 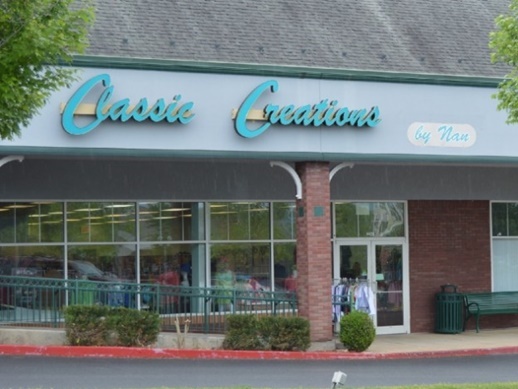 Classic Creations by Nan is an original “Bling” store in Branson that offers elegant knit shirts and jackets for ladies. The store offers embellished shirts and personal clothing items for ladies and they will gladly embellish any of your chosen casual shirts. There is always new merchandise that arrive daily at Classic Creations and there are only a few of many sizes so you need to come early before the last item is gone. The store offers elegant fashion wears and other fun stuffs for ladies. Along with their own label, they also carry Damee, Yushi, Smashed Lemon, and Erin London. When you drop at the shop, you can check for more of their unique fashion accessories. Some of ladies fashion wears that you can get from the shop include Ladies Crystal Zippered Knit Jackets which are made with a soft and cuddly cotton knit with added crystal zipper, pockets and lots of sparkle. Sparkle Ladies Denim Jackets which Nan has worked many hours with both designers and manufacturers to develop what they believe is the most beautiful, elegant, ladies jacket on the market. This jacket comes with fashionable rounded fronts, crystal buttons, and has the finest imported crystals. Decorative Rhinestone Knit Tops is another fashion accessory for ladies that are made of soft combed cotton, with ¾ sleeves, and with addition of special touch sparkle. All of the Knit Tops at Classic Creations will still hold their shape wash after wash, and best of all you can just throw them in the dryer. So, if you are looking for a unique shopping spot that offers elegant fashion wear and accessories for ladies, Classic Creations of Nan in Branson is the place to go.